I have enjoyed and hated mineral foundations for quite some while. I have issues with my skin being just too dry for it to work on even the best of days. Recently though, I've begun to enjoy mineral makeup on my lips. 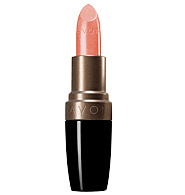 I first ordered an Avon Smooth Minerals Lipstick late last year in Apricot Glow and have loved it so much that I proceeded to get another one in the new colour Island Glow. While Island Glow was not the colour I thought it would be (more peachy in the pic) I did end up with a great neutral colour that is reminiscent to Mac's Viva Glam II. I also have been enjoying mineral lipgloss from ELF's mineral line called Au Natural. The container is a dupe for Mac's Lipglass packaging. I found that this colour turned out to be a perfect gloss match for the Avon Island Glow so I often wear the two of them together for a great effect. Day to day this is my neutral lip colour combo. Smooth, not gritty or sticky, actually probably the least sticky gloss I've tried in a long time. I also love that it isn't sheer, it is quite opaque. Showing how much the packaging of Elfs Mineral lipgloss and Mac's Lipglass are alike. I am more that pleasantly surprised with how much I've ended up loving these mineral products.